Mailbox Forwarding offers a new way to handle your paper mail that's much more convenient than a traditional mailbox service store. With our remote mailbox service, you can keep in contact with your mail wherever you are. We provide you with a mailing address which is accessible online. 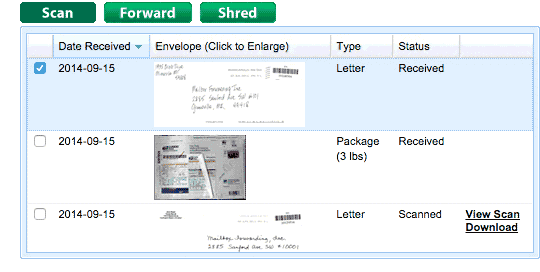 You can view all the mail you receive online: letters, documents, and packages, whether delivered by the USPS, FedEx, or UPS. With pricing starting at only $14.95/mo and no setup fees or commitments, our service is a fraction of the cost of a traditional mailbox service, virtual office address, or PO box that doesn't even provide online access. And our mail forwarding rates are some of the lowest in the mailbox rental industry.